The lever paradox is a deceptively simple mechanism that inspires curiosity precisely because it does nothing, when it looks like it should be doing something. The mechanism is stable regardless of the position of the weights or the angle of the horizontal beams. How can this be? If you remove a weight, then sure enough that side of the mechanism rises. When you replace the weight, the mechanism doesn’t move. At Armstrong Metalcrafts we’ve noticed that people will frequently stop to examine the lever paradox and move the weights around to see how it works. That’s usually followed by a conversation to explain it. 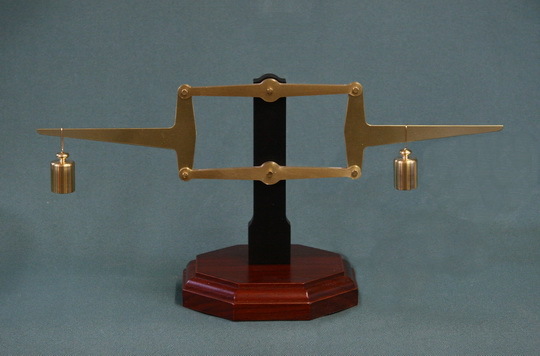 The linkage was originally invented by the French mathematician Gilles Personne de Roberval and first demonstrated to the French Academy of Sciences in 1669. People are often surprised to learn that this mechanism is at the heart of the commonly used twin-pan balance. 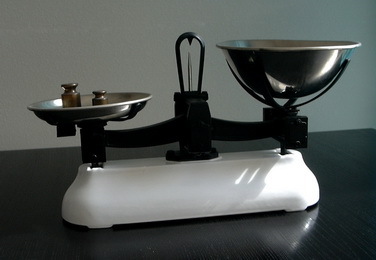 The advantage of the twin pan balance is that the weights and items to be measured can sit anywhere on the pan and the comparison will be correct. To measure out a specific weight of a product, the known weight value can be placed on one pan and the product added anywhere on the other pan until the balance is stable. Armstrong Metalcrafts is building a limited number of these for sale. The retail price is $195, and this includes a small booklet featuring an in-depth description of why this mechanism works. To inquire about a purchase, please use our contact form or send an email to "sales" at armstrongmetalcrafts.com.